The device combination ISOMETER® IRDH275BM-7 and the coupling device AGH675S-7 or the coupling devices AGH675S-7MV15 is designed to monitor the insulation resistance of unearthed medium voltage systems (IT systems). It is suitable for universal use in 3AC, combined AC/DC and DC systems. AC systems may include extensive DC-supplied loads. The AMPPlus measurement method meets the particular requirements of modern power supplies which often include rectifiers, converters, thyristor-controlled DC drives and directly connected DC components. 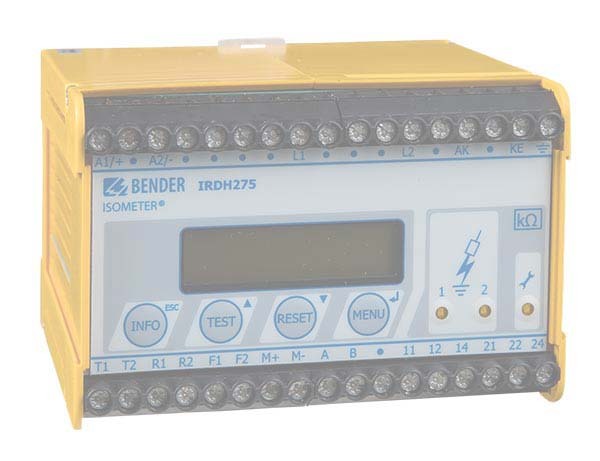 Taking the system leakage capacitances into account, the IRDH275BM-7 automatically adapts itself to the existing system conditions in order to optimise the measuring time.